This is the twenty-seventh in a series of posts about war tax resistance as it was reported in back issues of Gospel Herald , journal of the (Old) Mennonite Church. Dutch Mennonite stages arms protest in his living room. Dutch Mennonite theologian H.B. 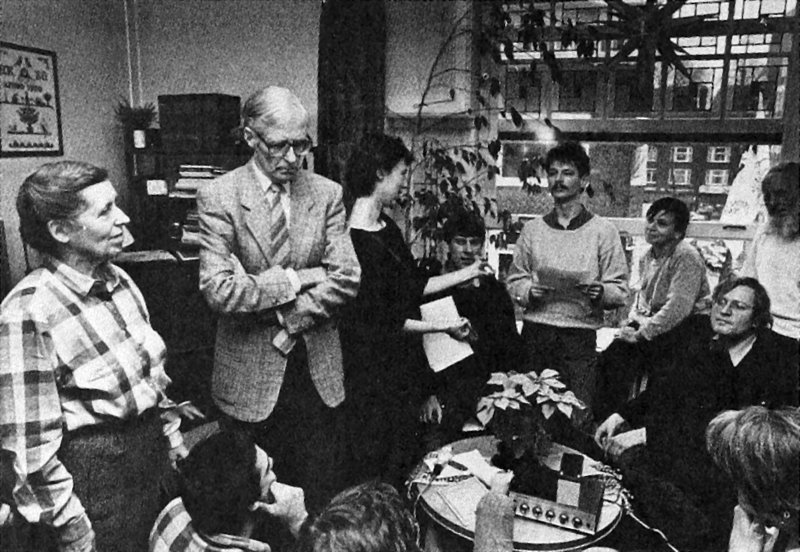 Kossen (standing, left) had a golden opportunity to explain his views on nuclear weapons to the media recently when a bailiff came to collect taxes he had withheld in protest against the placing of American cruise missiles in Europe. The bailiff collected the money by holding an auction at the Kossen apartment in Amsterdam. Kossen and his supporters, including politicians and church leaders, used the event to hold a press conference and communion service. Over 70 of the supporters announced they would also begin withholding a symbolic portion of their taxes. 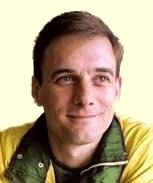 Kossen, who was one of the main speakers at the 1978 Mennonite World Conference assembly in Wichita, Kans., teaches at the University of Amsterdam and at the Mennonite seminary on the same campus. His protest is part of a growing peace movement among Mennonites and others in the Netherlands. It is estimated that one fifth of all the Dutch people have participated in street demonstrations against the cruise missiles. There was also lively and extended discussion about a report from the Tax Withholding Task Force. This group had talked to representatives of MCC’s supporting denominations about whether MCC should honor the requests of four employees that it no longer continue to forward to the government the military portion of their withheld federal income taxes. Phil Rich, who chaired the task force, reported that while there was much soul searching and serious attention given to the request, none of the denominations were ready to counsel MCC to honor the request for institutional involvement in illegal non-withholding. Four board members [out of 37] voted to support the request of the four staff persons. “Our history tells us that actions of minority people like this” lead us to greater faithfulness, said Larry Kehler. Once again it is tax filing time. For those who object to their tax dollars being used to fund the military, this is an agonizing time. To help such people, Mennonite Central Committee U.S. Peace Section has just completed an information packet on military tax opposition, and designated an alternative fund for those wishing to channel a portion of their tax dollars to a peaceful purpose. The free information packet includes descriptions of varying theological positions on the war-tax issue, the 1985 federal budget allocation of funds, a discussion of options available for war-tax opposition, and information on Internal Revenue Service action as a result of tax resistance. The alternative fund will channel tax dollars to victims of political violence in Guatemala. Human-rights abuses are again increasing in that Central American country. A modest proposal: Let the Christians of the world resolve to give more of their wealth to God than to Caesar’s armies. For those who consider tax resistance incompatible with their interpretation of Scripture, we would suggest a strict observance of the biblical injunction to tithe. Every year Christians, like other citizens, pay their federal taxes. For most people, these taxes are deducted from their paychecks automatically, so that the cash flow into the government coffers is regular and abundant. While some may be disquieted by the fact that 57 percent of their taxes goes to the military, most will remember the verse “Render unto Caesar…” and make sure Caesar is paid. Why is it, then, that the Mennonite Church cannot “Render unto God…” with equal ease? The Bible, in fact, goes into considerable detail about how to give our money to God, even giving us the standard of a 10 percent tithe. Yet we are inexcusably lax in practicing this biblical injunction. By recent estimates at the Ames (Iowa) Assembly of the Mennonite Church, Mennonites contributed between 5 and 6 percent of their incomes to the church. Can we rightfully claim that we pay our federal taxes because the Bible tells us to, while failing to pay our tithe? Surely if being biblical were our honest intention, we would make absolutely certain that God’s tax (the tithe) was paid in full. What is God to think of us? According to the Center for Defense Information, an average U.S. family of four, earning $25,000 a year, would normally pay $2,064 — or 8 percent of their income to the military. Thus it appears likely that Mennonites pay more to Caesar’s armies than to the church. We think it is time to correct this situation. Each congregation should appoint a tax collector whose duty it must be to collect 10 percent of each member’s income every month. Provision should also be made to collect back tithes and accumulated interest fees from the date of membership to the present. Those who find it hard to pay could simply borrow from their federal tax payments. Certainly God must be honored with our tithes. If that means Internal Revenue Service received only 50 to 60 percent of what is owed, perhaps we could discuss the problem sometime during a Mennonite Church assembly. On another matter, the committee struggled with the issues posed by MCC employees whose request not to have income taxes withheld was rejected after long debate at the MCC annual meeting in January . It was decided at that time that, despite this decision, MCC should continue to affirm the integrity of those objecting to war taxes and establish a committee that would study and create broader awareness of the impact of militarism on refugees, hunger, and development. But the mandate of that group, which is to begin meeting in June , was not clearly defined. Executive Committee chairman Elmer Neufeld said there seems to be a “strong expectation” from some that the special committee will continue to work specifically on the taxwithholding issue. Tax resisters give money to needy causes. 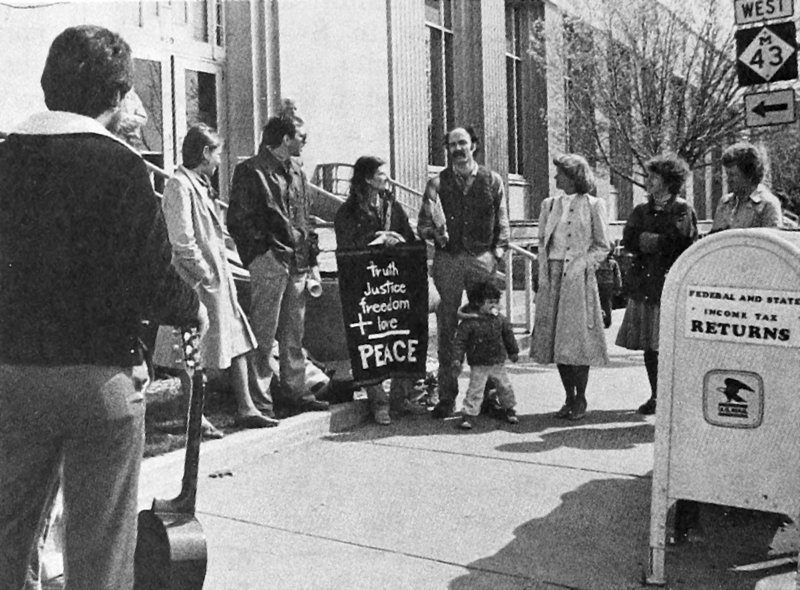 Ten Mennonites, Catholics, and Brethren gathered in front of the courthouse in Kalamazoo, Mich., on Apr. 14 to voice their opposition to military spending. Instead of paying the Internal Revenue Service the portion of their income taxes they claimed would go into the U.S. defense budget, they chose instead to give their combined withholdings totaling $1,600 to five local social-service agencies. Ellen Kinsenger-Roihi of Center City Housing (third from right) and Marcia Jackson of Loaves and Fishes (extreme right) were present to receive checks for their agencies. Three other checks were mailed during the demonstration to Habitat for Humanity, Kalamazoo Diaeonal Conference, and Kalamazoo Youth Ministry. Flanking the banner are four of the tax resisters (left to right): Deanna Brown, Terry Ciszek, Joanne Lehman, and Andrew Lehman. Eight Chicago area Mennonites participated in a “die-in" and street witness at the post office in Chicago on Apr. 14 to demonstrate their opposition to President Ronald Reagan’s request for $100 million in U.S. aid to the “contra” rebels in Nicaragua. 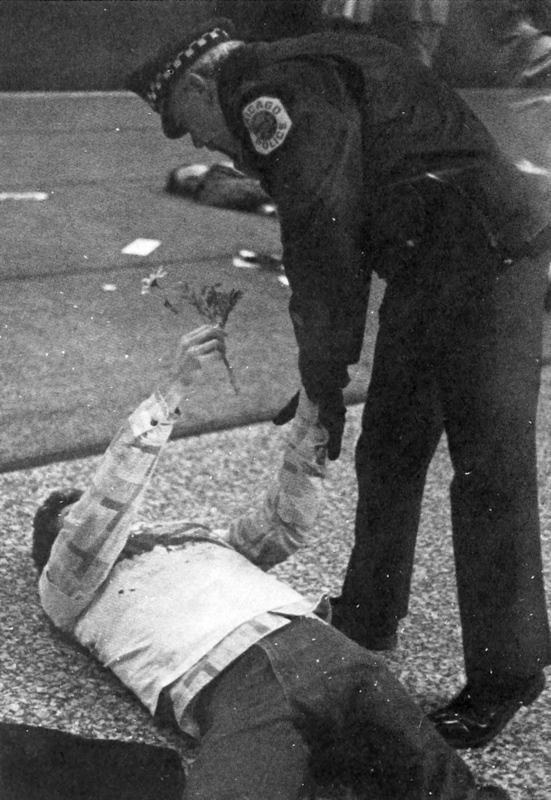 Here a protester hands a flower to a police officer before being forcibly removed! Kris Chupp and Dorothy Friesen joined 25 others who entered the post office and dropped to the ground one by one to dramatize the reality faced by Nicaraguans daily as a result of contra raids on that country. Orlando Redekop placed flowers on the “dead” and told the people mailing their tax forms the day before the deadline that their taxes are used to kill Nicaraguans. Other Mennonites joined the 300 demonstrators outside the post office who put up posters depicting a bloody hand on a tax form. The Mennonite participants are part of the National Pledge of Resistance movement, whose members have committed themselves to resist U.S. military escalation in Central America. My first contact with the income tax issue was at Bethlehem 83 , where a part of the Mennonite Church decided it wasn’t going to collect taxes for the government. I admired that position. In 1984 I began to study economics, and it led to the income tax. I have been studying the income tax issue for a year now and have quit paying income tax or filing tax forms on moral and legal bases. Mennonites are famous for nonresistance. I have come to believe that it’s easy to say we’re nonresistant and we want peace throughout the world and at home. Then we turn around and pay for the very acts we as Christians feel are wrong. As Christians we say war is wrong, killing is wrong, and that Christ told us to love our enemies. Is it love when we pay to have our enemies bombed and killed? Is it love to kill unwanted babies and pay for it with money that we earn by the fruits of our labor? I suggest if we pay for it we are just as guilty of the crimes against humanity as are the ones who actually do it. If a person pays another person to kill someone he can be charged with murder and sent to jail under our legal system. I believe God has a much higher standard for his people. I can no longer pay for murder and justify it by Romans 13 because God has instituted government. I will obey government if its laws are in harmony with God’s laws. I will also obey government only if it follows the law that was laid out for this country in the constitution. What sets a Christian apart from the world anyway? We don’t act because we might lose our money and power. It’s purely selfish reasons that we give for going along. Christ died on the cross for not going along. Disciples were put in jail for not going along. What is a Christian? One who says he loves his neighbor and pays to have his enemies killed? I believe not. The Internal Revenue Service has threatened to prosecute me and has fined me $500 as a civil penalty (I have refused to pay it). They have tried to audit me (I will not submit to their assumed authority) and they have threatened to seize any property I own and levy my wages in payment of alleged taxes. They will eventually do one or all of the above. Four years ago I had a “net worth” of $20,000. Today it is around $1,000 as I have sold off most all that I had. I will never be able to personally “own” a car or house since the IRS would take it. I will lose my $25,000-a-year job as a direct result of my actions. I will most likely end up in a federal prison for my beliefs in God and country. The most-asked question is “Why?” My answer is, “Because it’s the right thing to do.” Christ calls us to obedience and while I do not by any means say that I am not prone to sin, I try to follow God’s calling in my life. By the shedding of Christ’s blood on the cross he paid for all our sins, but that doesn’t give us the right to ignore our sin for personal gain. Finally, the 2 December 1986 announced the availability of a “War Tax Resistance Seminar” video, featuring speaker Willard Swartley and panelists Kenneth Covelens, Maynard Shirk, Frank Albrecht (the last two were specifically identified as war tax resisters).